Will the American People Get Satisfaction? I fear we will not. Both parties are trying to make their case beginning with “The American people have shown….” Lately, it’s more from the Right than the Left, perhaps because Republicans are basking in the aftermath of their election victories, and still objecting to anything. Yes, anything–not just anything coming from the President or the Left, but anything. In my previous post, I suggest several characterizations of such rhetoric: First, it’s insulting to suggest that any of the specifics objected to (e.g., immigration reform of a certain type) were on the ballot–thus, cannot be argued to be the position of the people; Second, it’s insulting to suggest “the American people” are of one mind on anything. In fact, 2/3 of registered voters did not even vote in these elections. But it’s clear that like our elected officials, we are highly polarized on many key issues. We are also the most diverse nation in the world. Thus, it is undoubtedly true that we have a diverse array of opinions. We may agree on a problem (jobs), but we have different opinions on how to solve the problem. What seems likely is that the absence of specific proposals from the Right will continue until the new Congress is installed. Then, the Republicans still have a major task of reconciling the Ultra-right (people like Cruz and Paul from a Libertarian bent, McCain and Graham from a hawkish bent) with mainstream Republicans. And, Republicans will have to deal with a President who seems ready to use his vero. While the American people want to “get things done,” it’s ridiculous to assume an extensive list of miscellaneous legislation will satisfy anyone.The American frustration is not likely to be assuaged by passage of legislation around campus sexual assaults, veterans benefits, or the like. It does not appear that Americans will be satisfied with only a few of the controversial partisan issues getting resolved by negotiated legislation–things like immigration and climate control (not that such resolution is likely). And, it’s doubtful that much satisfaction would be provided by a negotiated resolution of the Keystone pipeline. That’s because the key issue appears to be around jobs, and the pipeline won’t create many jobs. In contrast to Republican claims of 600,000 to 3.5 million jobs, estimates from Trans-Canada itself have the construction jobs down to 9,000 only, and estimates of permanent jobs after construction are as low as 35, Forbes reports from sources. These lower numbers are further confirmed by comparison to the actuals from the Trans Alaska pipeline, which was much more complex and expensive than Keystone is expected to be. In my just previous post here, I acknowledged no-one knows what the American people really want. Specific actions preferred are diverse, where they exist at all. But there is clarity about one overarching issue that needs fixing, even if the way to fix it is disputed. 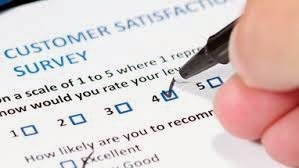 My guess coming from numerous polls and addressed repeatedly (superficially) by politicians, is that there is much commonality in jobs dissatisfaction. Jobs problems are the big beef of the American people! While the economy has improved dramatically since 2009, unemployment down to 5.8%, frustration remains about the nature, wages, and security of the available jobs. C Class compensation has skyrocketed. Just look at today’s SF Business Times list of top paid Bay Area CFO’s, one step below CEO’s. Annual comp for those 50 ranges from a low of $3 million annually to a high of $38 million. Per capita income in my city of San Francisco is $47,000. Lots of people have been forced to take lower paying or temporary jobs, in desperation. So, whether the blame is placed by some Americans on Democrats for this complex set of unresolved and seemingly deteriorating jobs issues, or by others on the Republicans, this does seem to be the central issue. Of course, there are those of us who are retired, in school, or solidly situated in well paying management jobs, for whom this is not a personal issue. However, even these worry about graduation or about the opportunity for children and grandchildren. How to deal with government is the key to resolving the jobs frustration. The Right has done a good job of marketing, placing the blame for all this on Obama, Democrats, and big government. Their solution is less and less government–move the jobs problem to the private sector. The question is whether or to what extent pushing the jobs problem to the private sector will work. Will private industry choose, with perhaps some tax reduction and other incentives, to pay more, provide more benefits, grant more security, conduct skills trainings to enable displaced workers to upgrade, etc? My guess is this won’t work very well. Of course, some companies are volunteering contributions to employment, social justice, or environmental justice. There is a slowly growing cadre of such. However, it’s too small, too limited, and too slow. Such gratuity is limited by its inherent conflict with shareholder bottom line motivation at the heart of capitalism. It costs money to do these things, and if all my competitors don’t do it with me, I will lose access to capital for the future of my business. This may be exacerbated by Conservative views that the best way to create jobs is simply to grow the economy, and the best way to grow the economy is to further relax any restraints on employers in regard to their obligations and costs of employment. Trust “the invisible hand” of capitalism. If capitalism limits the extent to which employers can justify additional protection to employees, and Conservatives are driving to further reduce any government imposed obligations to do so, it is unlikely we’ll see significant improvement. In fact, maybe even the opposite. The jobs problem is further complicated by structural issues such as automation, outsourcing, and globalization. It is clear we need government to motivate and restrain the excesses of capitalism when these result in social or environmental injustice. The problem is that government is terribly inefficient, and the American people are rightfully frustrated with the cost and inefficiency, with which frustration the Right has taken advantage with messages boiling down to “let’s just starve the beast,” because (unstated) we don’t have the ability to manage government effectively. It is true that there is a great deal in government that could be made more efficient, and there is also a great deal we could do without. Consider one example with which I am quite familiar, having spent a career in it: Banking. Federal Financial Analytics has estimated that the new financial regulation (Dodd-Frank) stemming from the great recession has cost the 6 largest banks an additional $70 billion, and that doesn’t include the costs of oversight by government regulatory agencies (OCC, FDIC, Federal Reserve, etc.). It also does not include the cost to business delayed and denied, and to the economy. 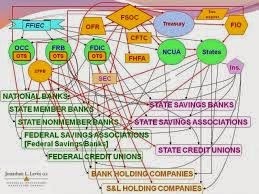 And this is just for the big 6 banks and just for the most recent wave of regulation. Bank regulation can be done a lot less expensively, making the wheels of financial commerce move much more swiftly, with a boost to economic growth. Many agree that a few simple requirements could replace thousands of pages of regulation, and hundreds of thousands if not millions now employed on both sides of financial regulation: Increased capital requirements; a requirement to retain at least say 25% of loans on the originator’s books; separation of investment banking and speculative activities into separate entities without FDIC or other government support and without use of average citizen’s deposits; requirement that borrowers (whether individual or corporate) be liable for at least 20% of the debt (fully exculpated loans prohibited); and a downpayment of at least 20% on home purchases. These rules could be the basis for elimination of much of current regulation. If so, why hasn’t the bank regulation been done this simpler way? Is it the fault of the Democrats wanting more detailed regulation-micromanaging? No. There is no marked difference between Democratic and Republican administrations in imposing such regulations. There is a rush from both sides to regulate when crises occur. Many economists blame the increased frequency of dramatic cyclical crises of finance on neoliberal economic policies gaining ground since 1980, supporting the freedom of “financialization.” When crises occur, regulations are designed by legislators who are not experienced in banking. Lobbyists representing banks have fought against simpler rules like the ones above, preferring all this paperwork, oversight and compliance over simpler rules which might reduce profits slightly and reduce freedoms for banks to speculate for their own accounts, with the implicit backing of the government. So, government is terribly inefficient in some areas. Granted. Does this mean we can just starve government and do without it? Trust the private sector for most everything? No–that would be at least equally foolish. If the Conservatives would work with Democrats in a combination of incentives to industry to seriously address jobs needs, much could be done. The “60 Minutes” TV weekly last night focused on one of the easiest opportunities –fixing our aging US infrastructure. Democrats cannot do anything about that, since Republicans will not spend the money. As Economist Paul Krugman has argued throughout the recovery, we are missing a great opportunity to both grow the economy and create lots of jobs. Jobs needed to fix roads, bridges, tunnels, ports, airports and even our internet access, will not be few, as with the pipeline–there will be millions, and the work will continue for years, just to catch us up with other developed economies. This will stimulate jobs, generate new sales for business, and make US industry more competitive. Without government controls, this won’t fully solve the need for wage growth and job protection, but the Right is missing a great opportunity in resisting addressing infrastructure improvement. There are other such opportunities. Conclusion: Americans mostly want jobs conditions to improve. Democrats who turned out for Obama in previous elections didn’t vote, likely disappointed with jobs performance, and not sure who is responsible. Voting Americans endorsed candidates with a political viewpoint that government cannot be used to fix the problem. Maybe they were lured by Republican rhetoric. Maybe they just wanted a change–any change. My forecast is that little meaningful will be accomplished in the next two years. We’ve been dtawn by tax reduction promises to starve government. 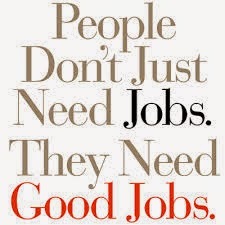 But government is needed, along with private industry, to make the desired improvements in the jobs market. In addition to rule of law, national defense, and internal security, government is needed for infrastructure, education, and health care. Most advanced nations recognize that private industry alone will not meet these needs, is not by its very nature able to do so so. And, government is our only protection from the excesses of unrestrained capitalism. We’re left to hope that the Republicans get reasonable across the next two years. There are quite a few competent and wise Republicans in the center of the party. However, it does not yet seem likely they will be able to control the extreme factions. 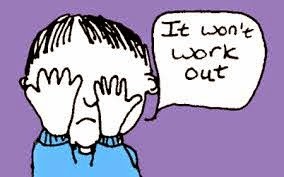 So, if they only manage to do little, but yet succeed in persuading Americans that continued jobs failure is the fault of government and Democrats, we’re likely to see a totally Republican administration in 2016–legislative and executive. Then, we’ll have to wait another 4 years for Americans to realize the totally private industry strategy is never going to work. It is not likely Americans will get much satisfaction for the foreseeable future, regrettably. Pipe Dreams: How Many Jobs Will Be Created By Keystone XL?